Meet School Girl, Rockabilly, Bathtime, School Boy, and the Ape! These flesh eating fiends are about 2" tall and are available in toxic green, pale blue, glow-in-the-dark, and white. 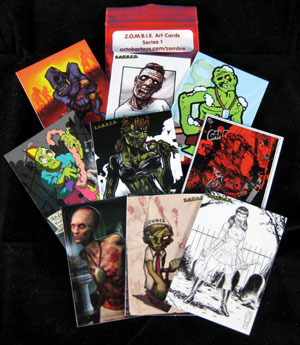 Set includes nine trading cards created by nine amazing artists and inspired by the Z.O.M.B.I.E.s! Exclusive red Z.O.M.B.I.E.s were available from Tsunami Tactical and exclusive color changing Z.O.M.B.I.E.s at Zombies & Toys! Series 1 Z.O.M.B.I.E. Art Cards include nine cards, each designed by a different artist and inspired by Series 1 Z.O.M.B.I.E.s. 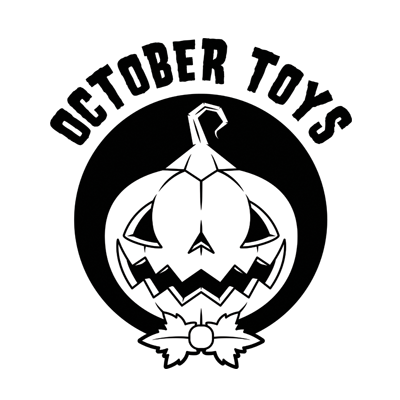 Artists include M, Ego, Louie Lanford, Robotboy from Triclops Studio, Dinosauria, Apeman from Triclops Studio, Neil Winn, James Demetra, and Tone Rodriguez. 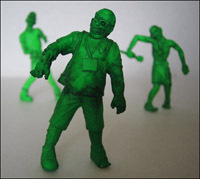 The limited edition "Attendee" zombie is the first of the zillions of mutated bodies infecting everyone! These hand made resin micro statues are 2" high, limited to 50 numbered pieces, and have sold out! This "13 Days of Christmas" Z.O.M.B.I.E. was made especially for the VTN 2007 Winter show! The jolly old fat man has gone on a bloody rampage! 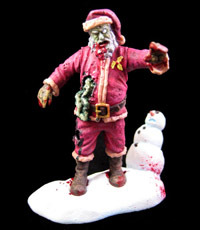 Each hand cast, hand painted, resin micro statue stands 2.5" high with his snowman base. This very limited edition of 13 pieces has sold out! This was our very limited 2008 Spring VTN exclusive hand cast and hand painted alternate resin version of School Girl Z.O.M.B.I.E.! She's all dolled up for Spring, limited to 13 pieces, and sold out! Z.O.M.B.I.E. : The Game! is a simple game that you can play using Z.O.M.B.I.E. 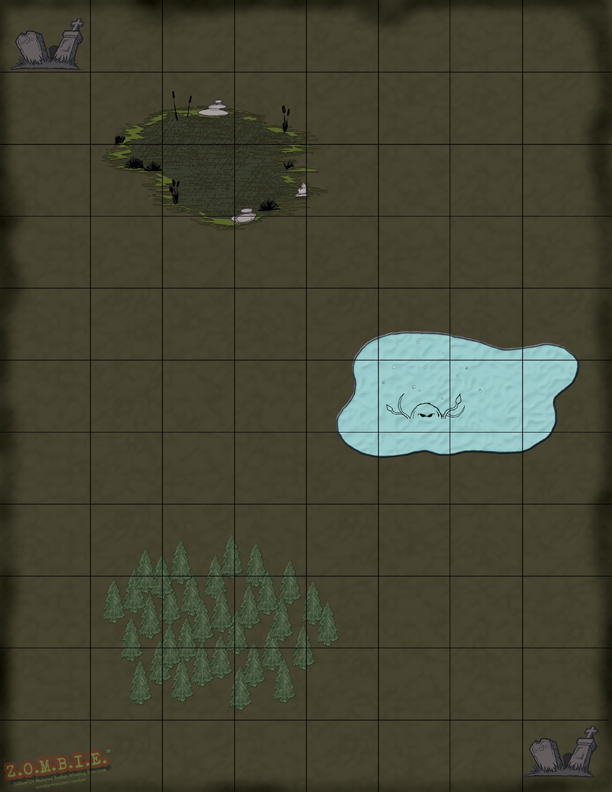 figures, a die, and a sheet of paper with 1" squares or downloadable map. The rules are designed for two people, but can be modified for as many players as you like by increasing the size of your map/play area and size of your Z.O.M.B.I.E. horde.